Each instrument contains a Noise Com precision noise source that delivers repeatable, symmetrical white Gaussian noise. The noise source is integrated with an amplifier, 10 dB attenuator with 1 dB steps, and power supply. The instruments have a 50 ohm output impedance. 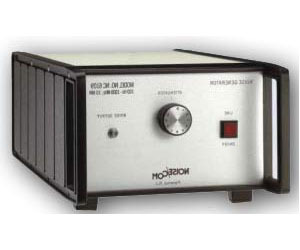 The NC6000 Series units measure 8.5 in. wide by 5 in. high by 12.25 in. deep. The NC8000 Series units measure 17 in. wide by 5.25 in. high by 13 in. deep, and they come with brackets for 19 in. rack mounting. Power requirements are 120 VAC, 60 Hz, at 500 mA for the NC6000, and 1500 mA for the NC8000. Operating temperature range is from -10ºC to +60ºC.